Remember my original Flurry quilt I made back in January using Alpine Ice fabrics by Island Batik? In June, I made this version using the Snow Berry fabric collection for Island Batik. 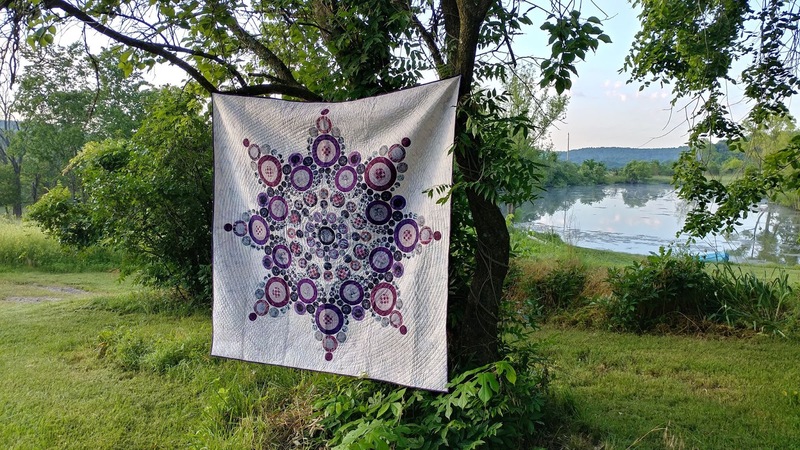 This quilt is in the current Island Batik catalog (pages 97 and 131) and will be displayed in their Quilt Market booth in Houston in November! The fabrics will be in shops in 2019. 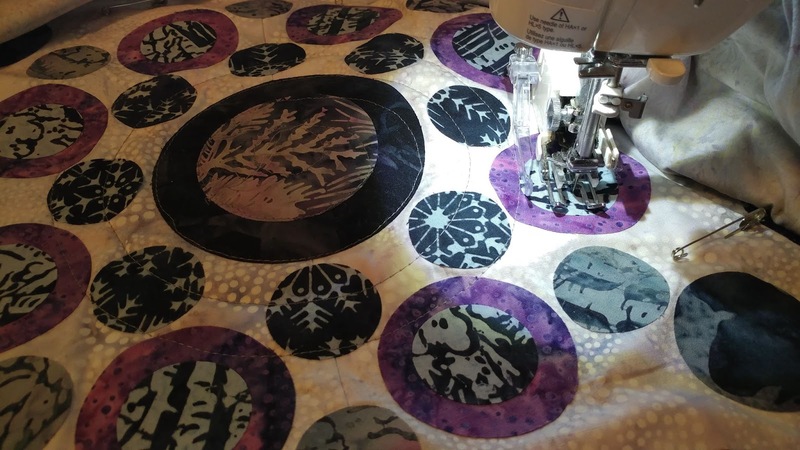 I use Lite Steam-A-Seam 2 and an Olfa Rotary Circle Cutter to make quick work of making the quilt. 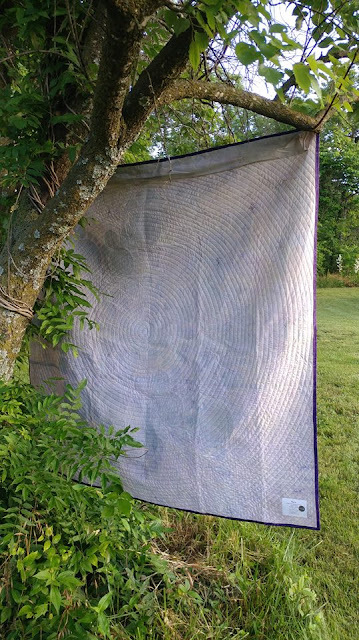 Once the circles were fused to the background, I pin basted the quilt with Warm & Natural batting. 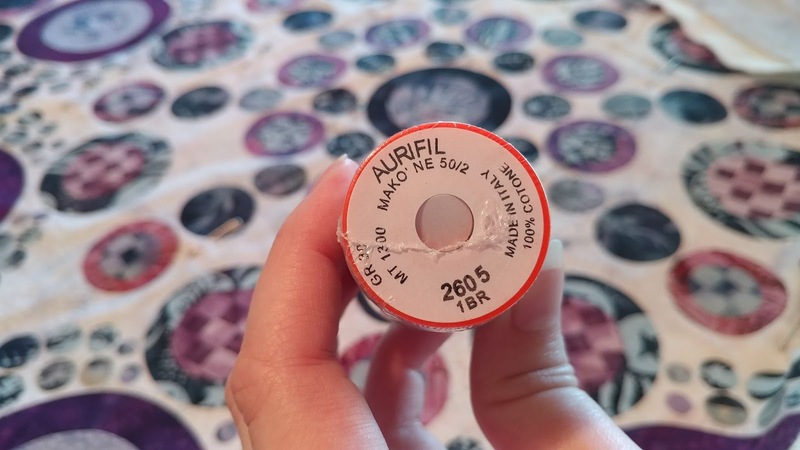 I used 50wt Aurifil Grey #2605 for the quilting. Due to the constraints of the deadline, I decided not to stitch around each circle like I did on the original. This time, I used my walking foot to quilt a spiral from the center of the quilt to the outside. I used the guide of my walking foot to keep the lines about 1" apart. 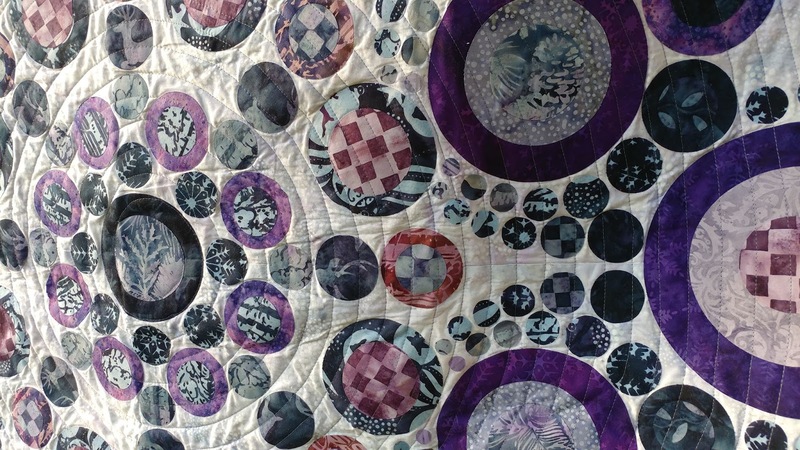 I think the smallest circles that didn't get sewn over may come off when the quilt is washed. I recommend stitching over every circle in some way to ensure they stay put. This was my 29th quilt finish for the year when I made it back in June (I've now made over 50 quilts so far this year!). The Flurry quilt pattern is available digitally on Etsy and Craftsy. The paper version is available on Etsy. The pattern is also available in many quilt shops! Please let your favorite quilt shop know you would like them to carry patterns by Slice of Pi Quilts! I absolutely love how bold and graphic this quilt is! Both the blue and purple versions are equally amazing. Which color is your favorite? What color/s would you use to make the Flurry quilt? Linking up with Main Crush Monday at Cooking Up Quilts, Monday Making at Love Laugh Quilt, What I Made Monday at Pretty Piney, Linky Tuesday at Freemotion by the River, Let's Bee Social at Sew Fresh Quilts, Wednesday Wait Loss at The Inquiring Quilter, Midweek Makers at Quilt Fabrication, Needle & Thread Thursday at My Quilt Infatuation, Finished or Not Friday at Busy Hands Quilts, Can I Get a Whoop Whoop at Confessions of a Fabric Addict, TGIFF at Celtic Thistle Stitches, and Friday Foto Fun at Powered by Quilting. It’s beautiful and a great way to show off the new line for market! Both are gorgeous!!! I love using my circle cutter and fusing everything. 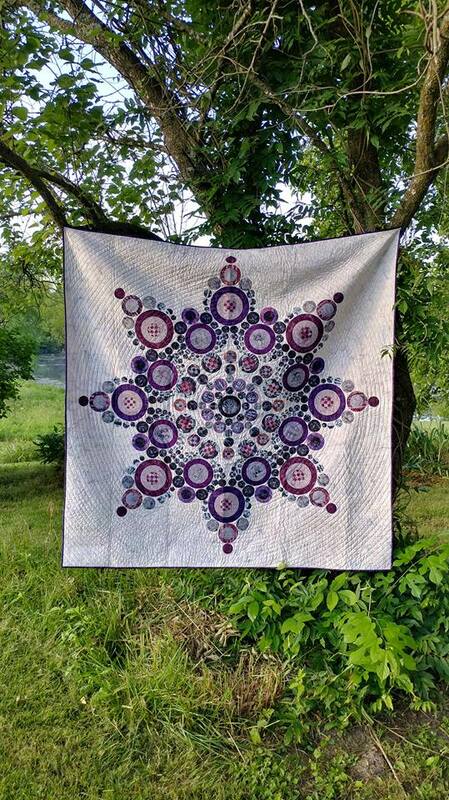 Now I want to make this quilt in pink for one granddaughter and purple for the other!! Your quilts are beautiful! I am a purple fan, but the blue one is just as pretty. I love seeing your work, it is an inspiration for me to get moving on what I should be sewing. How fun to have this quilt hang at Quilt Market! The colors just draw you in. 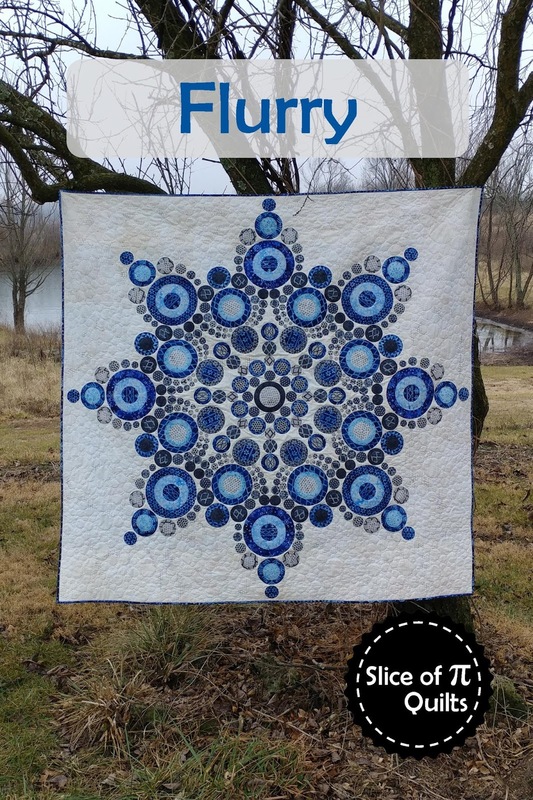 Spiral quilting is one of my absolute favorites! I love both versions, though the blue reads more snowflake to me. Beautiful! Sew pretty! I like your quilting on this one, too! 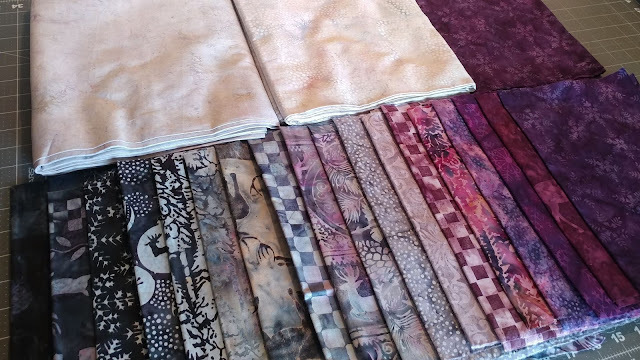 Both versions are gorgeous, Laura, and thanks for sharing links to the fusible and circle cutter you use. That Olfa circle cutter works like a compass, right? I am currently trying to figure out the most efficient way to cut out 9 1/2" clam shells. I have an acrylic template the correct size and I know I could do the convex curve at the top with a small diameter rotary cutter, but I am chicken to try cutting the two concave curves with a rotary cutter for fear of nicking my template and/or my fingers (like I did when I tried to cut out Drunkard's Path blocks with a rotary cutter, cough cough...). If you know of any nifty cutting gadgets that would work for my clam shells, let me know! :-) Also, question about your gorgeous Flurry -- is the background one huge piece of fabric before any circles are fused down? 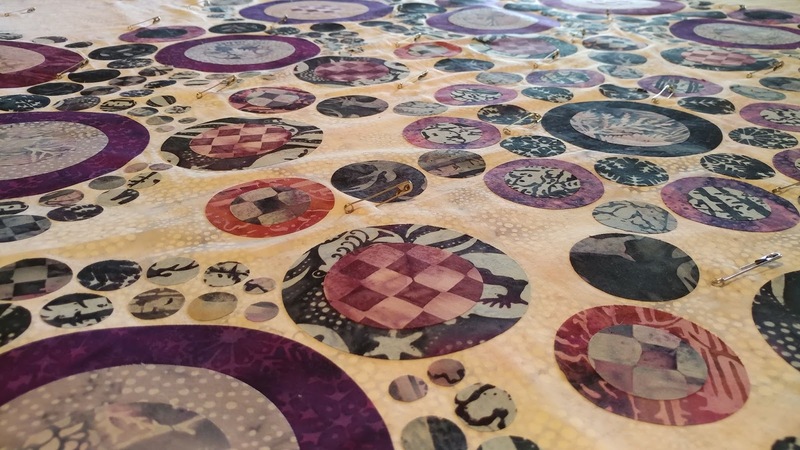 I'm imagining myself with a hundred paper patterns taped together, crawling around a giant piece of fabric and trying to get all the circles laid out correctly beneath the paper, and in this nightmare of mine I do not end up with a beautiful quilt like yours at the end. Do your pattern instructions contain a goof-proof, beginner friendly (beginner to fusible applique, not to quilting) method to get all the pieces fused in the right places? That's the part that's scariest to me! Thank you, Rebecca! The circle cutter does work like a compass. I'm not sure if it would work for clam shells - I've never tried that! I just finished cutting a slew of drunkard's path blocks. I used a rotary cutter. A smaller cutter with a smaller blade often helps tremendously when using acrylic templates. The background of Flurry is one large piece of fabric. There are no paper templates or guides or anything to print and put under the fabric. I recommend using Lite Steam-A-Seam 2 for the fusible because it is sticky and the pieces stick to the fabric before ironing. This way you can hang the background fabric up, place all the circles (and move them around as needed), then move it over to the iron once you're happy with it all. The pattern walks you step by step through the process of adding the circles so yours will turn out just like mine! If you use the Steam-A-Seam, I definitely think the pattern is beginner friendly! I've made the quilt three times, and other than different fabrics, the quilt turns out exactly the same each time. I'm confident yours will turn out great too! 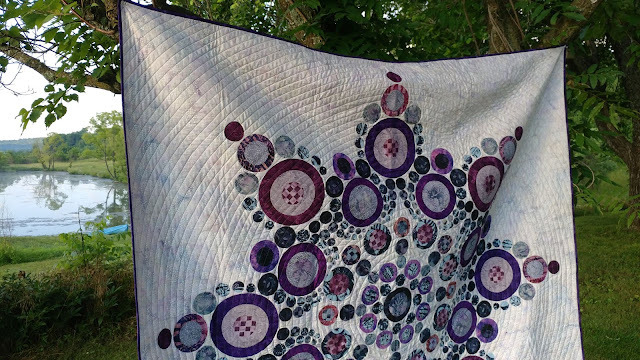 Quilty secrets are the WORST, but your quilts are the BEST and totally worth waiting to see. Lovely, and a perfect way to show off the fabric line. Thanks for linking up to What I Made Monday! 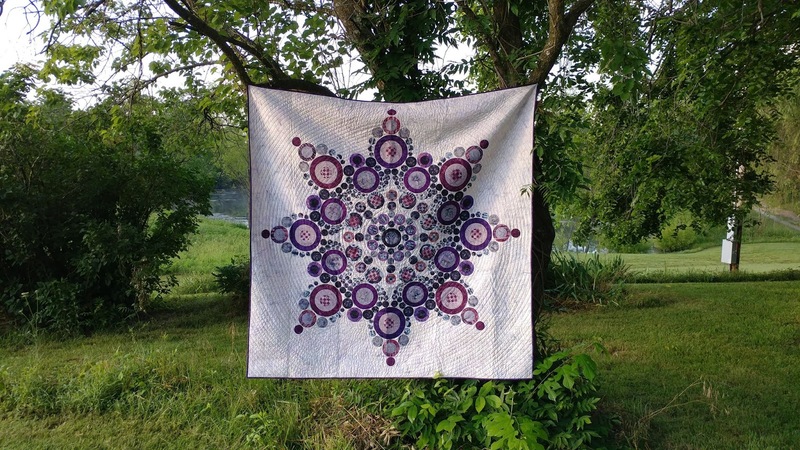 These are such beautiful quilts! Personally, I'm in love with the blue one - it so reminds me of snowflakes. Stunning! Couldn't choose between the two- the are both amazing. And more than 50 quilts so far this year? I'm blown away. Great use of the fabric. Your beautiful design sparkles. The pic of the back with the light is wonderful. Wow! 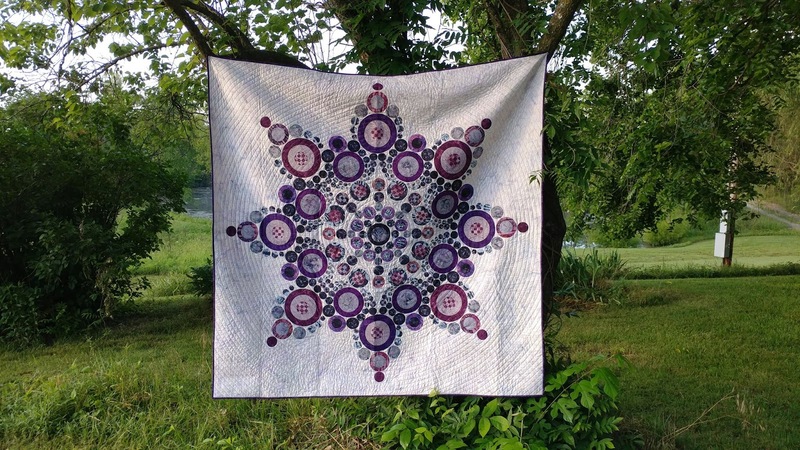 Your quilt is lovely, but the real wow is 50 quilts! That's a lot for one life, let alone one year. 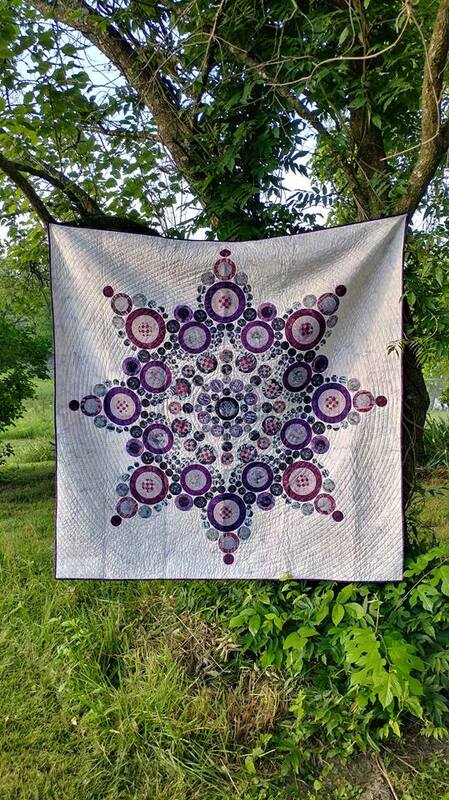 Congratulations on the finish and on having your quilt going to quilt market. Yikes Laura! I love this quilt. The results are just gorgeous and after reading your explanation up above to Rebecca Grace, it seems so easy. Really a great design. I love the purpler version. Both are beautiful! I love the blue one with those small pebbles, and the purple one with the spiral! This is another beautiful version of this quilt. Loved the original version and I love this one too because my favorite color is purple. Congratulations on the getting a quilt to Market! Thanks for sharing on Wednesday Wait Loss. I love this quilt... as much as I loved the blue one, I think the purple one is my jam... I have a healthy obsession with purple lol :D Can't wait to see this at Market in person!! !